Book your vacation at the ultimate modern vacation rentals in the rugged outback of the Big Bend region. In a land of endless mountain and desert vistas that is famed for ghost town ruins, rustic adobes, and Old West ranch homes, the Fossil Knob Ridge vacation rentals offer a unique contrast. 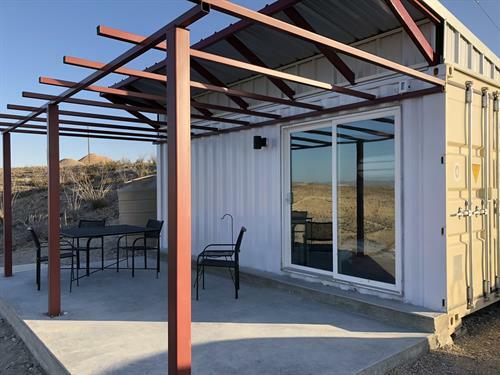 The ultra-modern vacation rentals at Fossil Knob Ridge are contemporary homes built from recycled shipping containers. Yes, you read that right. These vacation rental homes are constructed from big metal boxes that were originally used for transporting cargo across the globe on trains and ocean freighters. The owner purchased them from a shipping company and converted them into contemporary and stylish living spaces. Don’t worry though, they are far more than just metal boxes with some furniture. Indeed, these homes offer the most neoteric lodging in the Terlingua area. Relax inside or on the shaded patio. Explore the fossil-strewn 20 acre property. Drive or walk into the Ghost Town to explore the historic ruins, dine, drink, enjoy live music, or hang out with local and travelers from around the globe. If you play an instrument or sing, join in on an impromptu jam, session on the porch of the old trading post. Drive into Big Bend Nation Park or Big Bend Ranch State park for endless outdoor adventures. Book a river trip, jeep tour, horseback ride, mountain bike rental, guided hike, or guided hunt. Enjoy a controlled campfire. Marvel at the night skies. Watch the stunning sunrises and sunsets. Do as much or as little as you like. Then, come back again and do even more or less. Located on 20 acres just behind the historic Terlingua Ghost Town between Big Bend National Park and Big Bend Ranch State Park.